Slowly pull up the keel of a sailboat as it’s racing straight across a large lake, and soon it will begin to wallow around at the mercy of the wind. The temperature difference between the warm Equator and the cold Arctic causes large-scale air motion to the Arctic. Like a river raging straight down a steep mountain, a large temperature difference causes air to move northward from the Equator fast and straight, bending with the rotation of the Earth to create a well-behaved jet stream that moves from West to East. The motion is reminiscent of a well-trimmed sailboat challenging the wind as it races straight and true across a large body of water. It is well documented that the Arctic is warming at 2 to 4 times the global average rate (read here and here). This decreases the temperature difference between the Equator and the Arctic, which decreases the driving force for the Jet Stream winds. The weakened driving force allows the jet stream to wallow around, just like a river that slowly meanders back and forth when it hits an area with only a slight elevation change (think flat). The image is similar to how a sailboat flounders about when the keel is pulled up: moving at the mercy of the wind instead of challenging it. In the same way that healthy arctic ice is linked with a strong, healthy jet stream that tracks relatively straight and true around the earth, so too a strong, deep keel is linked to a sailboat that tracks straight and true. 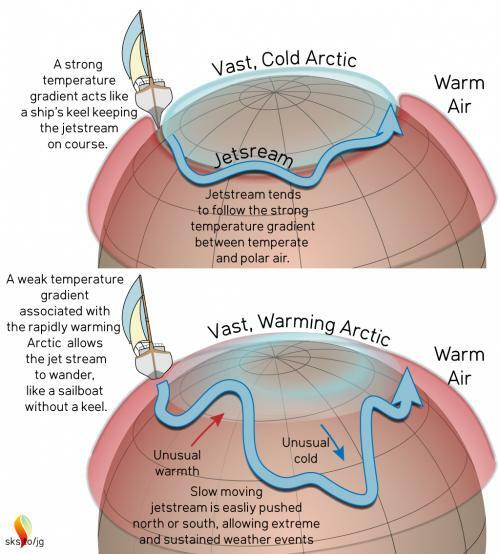 It is the melting Arctic ice that is causing the jet stream to lose its “keel” and change from tracking straight around the globe from West to East, and instead meander aimlessly. Remembering that the temperature of ice is 0°C or colder, as long as there is ice there are stable, constant, cold temperatures in the Arctic. Once the ice is gone, the water is free to warm up to any temperature above 0°C. The fundamental cause of the decreasing temperature difference between the Equator and the Arctic is melting Arctic ice, but the reason for the rapid warming is the changing albedo from reflective ice to absorbing ocean water. The relationship between the temperature difference of the Equator and the Arctic and weather patterns is complex, and is a topic of active, ongoing research. Although the link between the rapidly warming arctic and the disrupted jet stream is solid, and although the link between the wavy jet stream and extreme weather is solid, the details of how the wavy jet stream is affecting weather is an active area of research. For those interested, researchers like Michel Mann, Stephen Rahmstorf, Jennifer Francis, Kerry Emanuel, Tom Knutson, Kevin Trenberth, and many others are actively researching the link between global warming and storms, and readers are encouraged to follow the work of these researchers. But here is a short summary of some of what is believed to be possible links between global warming and changing weather patterns. A slowing, meandering jet stream is associated with weather patterns persisting for longer periods than they would with a jet stream that blows more strongly and directly in a West-to-East direction. A few hot days can turn into a heat wave, a period of rain can turn into a flood, and a period of dry weather can turn into a drought (read here). The Jet stream may shed high-pressure systems that act like blocking highs. This is part of what is believed to have caused SuperStorm Sandy and Hurricane Florence to turn into the East coast of the US rather than assuming a northward trajectory that would have kept them away from the East Coast of the US (read here and here). We now have a sailboat circumnavigating the Earth with a broken keel, wallowing about. It is not clear what if anything we can do about this. Even if we are wildly successful at controlling GHG emissions and are able to limit total warming to 2°C, the wild weather we’ve been increasingly experiencing will likely be with us for a very long time. "A meandering jet stream allows deep troughs and ridges, allowing some areas to get unusually warm while other areas become unusually cold (read here, here, and here)"
Living in Edmonton Alberta a few years ago in mid winter we had one period where temperatures were well above zero when they could just as easily have been -30 C. While at the same time Eastern Canada and the US all the way down to Florida were in a deep freeze with very cold temperatures. Climate change is not a smooth and gradual process to a slightly warmer Earth, it comes in chaotic jumps and pauses and can have devastating impacts. Now living back in BC we've had two consecutive years where much of the province has been under a state of emergency starting with too much water too fast in the springs to not enough in the forests during summer heat waves. Large parts of this province have been consecutively drowned and then burned and we're certainly not alone with this weather chaos that comes as natural systems like the Jet Stream and other global scale systems are destabilizing and moving into a much different state. Something that will in fact take centuries. No matter what we do we have left chaos for many generations to follow to deal with. And if we don't take this bull by the horns and very soon, the chaotic conditions this creates may overwhelm first complex human society then after a global collapse our species itself. And yet we still have politicians here in Canada who demand we keep expanding the extraction and burning of fossil fuels. Paul Beckwith has proposed the alarming notion that, when the Arctic Ocean goes essentially ice-free, and the North Pole is no longer the coldest region in the Northern Hemisphere, that honor will pass to Northern Greenland. The question is, would the Jet Stream follow along, doing its dance with Greenland being the center of circulation, a full 17 degrees from the pole? Paul declined to speculate on what the effect would be on weather patterns, but it's not likely the result would be favorable to the humans. Doug_C@1 "'Climate change is not a smooth and gradual process to a slightly warmer Earth"
i'm sure you'll agree that the word "slightly" only applies when you look at global averages, and that there is nothing "slight" about the warming in the Arctic. This is the deceptive nature of uneven warming, especially when the jet stream is driven by temperature differences. Sunspot@2 Interesting points you make. Is it the case that the jet stream we grew up with required the cooling of both the Arctic and Greenland? In other words, even if the track of the jet stream is influenced by what becomes the coldest part of the northern hemisphere, will the strength of the jet stream be dictated by the net cooling of the Arctic plus Greenland? In that case it would seem that the loss of Arctic ice will irreversibly decrease the net cooling up there. I agree fully, I was referring more to contrarians who use the claim that a few degrees increase in global temperature will have little impacts. When we already see significant changes in climate in many places and very troubling responses in biological communities such as the massive die offs of coral reefs in places like the Great Barrier Reef. This temperature increase is averaged over the entire globe and as the meter constantly ticking here indicates, the addition of billions of tons of carbon dioxide to the atmosphere mostly from fossil fuels use also adds an incredible amount of heat to the Earth's surface. Over 2.685 billion Hiroshima bomb heat units since 1998 alone with 4 more being added every second. We are reordering how heat and thus weather and climate is distributed around the Earth and this is already having catastrophic impacts. The increase in global average temperature may be "slight" in relation to the overall temperature of the Earth, but there is nothing slight in the impacts. And at some point we will hit tipping points that will likely force rapid changes to an Earth that simply will not support many of the current species here now. Ecosystem transition on a global scale as has happened in the past with rapid excursions in CO2 and then climate are now referred to as Extinction Level Events. Do we really want to create one that we will all be caught in. The Jet stream doesn't shepherd weather systems around the world. This theory is like the old plum pudding model of the atom. It is the wall of rising air under the jet stream which marks the boarder between the Polar Hadley Cell and the Ferrel Hadley cell. Leaving that aside there is a, possibly, more illuminating way of thinking of what is happening and hence what is coming. Clasically, with the Artic ocean and surrounding land covered in snow, radiation is reflected back into space. The air above the Arctic also radiates heat into space, becomes dense and falls to spread out south as it hits the surface of the earth. This is what powers the Polar Hadley cell. You all know about the Equatorial Hadley cell and a idler gear (the Ferral cell) is needed in between. The Polar and Equatorial cells can not meet. (At mid latitudes the Equatorial Hadley cell causes falling air while the Polar cell at mid latitudes causes rising air). When the Arctic ocean is ice free for a significant portion of the summer, we will have rising air over the Arctic and the jet stream, which is now weakening due to the weakening of the Polar Hadley cell should disappear. Essentially the Ferral cell will extend to the Arctic Ocean. Climate zones will jump northward in contrast to their present slow creep and with them, the grain growing areas of the Northern Hemisphere with obvious results. We also have to look at what a summertime ice free Arctic ocean will mean for the stability of the Greenland ice sheet. Instead of a large reflective - and frozen surface - covering the ocean to the north of Greenland, there will be a body of water that absorbs 90% of the summertime sunlight. What will relatively warm and humid airmasses moving off the ocean and over northern Greenland in the summer do to the thick ice located there? None of these systems we are looking at are stable in the short or even mid term, that is the lesson we are learning from global warming and associated climate change. From abrupt climate change on wikipedia. "An abrupt climate change occurs when the climate system is forced to transition to a new climate state at a rate that is determined by the climate system energy-balance, and which is more rapid than the rate of change of the external forcing." Abrupt can be on anything from decadal to multi century time scales, but its important to realise the paleo history has some huge changes on decadal to single century time scales.This includes abrupt changes as atmospheric circulation changes, and this tends to be regional, and abrupt sea level rise which can be regional or global. By analogy its like tobacoo smoking causes about 20 diseases so which one (or ones) will you get? Nobody knows. Its all a horrible gamble. william@5 Thanks for the interesting clarification about the dynamics of the large-scale circulation systems. nigelj@7 Or as Richard Alley states, there is evidence in the ice-core records of abrupt changes that can occur over a period of years.